Snow. Finally. A real snow, the sort of snow northerners take for granted, a snow that falls for days, that blankets everything in sight, that blurs the edges of the world, that means you can ski. That kind of snow. Oddly, when we planned our move from Montana to New Mexico, I never considered snow. Or its absence. It wasn’t until we were actually enroute to New Mexico (in January) that it occurred to me I had just agreed to live in the south. In country where, maybe, it didn’t snow. And it doesn’t. Much. Enough falls in a few ski areas that they can make a go of it. Taos is one of the world’s great ski areas. But Taos is practically in Colorado. Down here in the middle of the state, we do not get a northern snow. It comes. It goes. 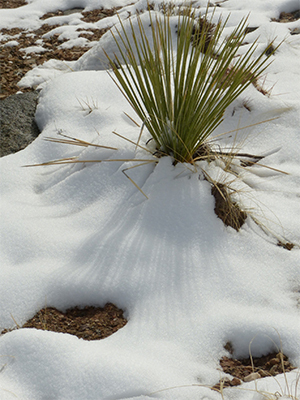 In the bright New Mexico sun, what seems a snow to last for days is gone in an afternoon. Nevermind. It was nice while it lasted. The first morning of our snow – which fell for the last two days of February – it was not very deep. (It wasn’t very deep the second morning either, but it covered everything well enough that you could pretend it was.) Walking Luke in the bosque, we paralleled one lone pair of ski tracks. Someone had come down early, before the dog walkers, before any chance of sun, and, skiing through grasses and over fallen twigs, managed to make a track. The second morning was better. As we walked along the irrigation ditch before crossing two bridges into the bosque proper, a lone skier skimmed along toward us. Oh, he looked good! A ski hat. A good stride. A look of triumph. Snow exists! We crossed the plank bridging the irrigation ditch, then the bridge over the clear ditch, entered the woods, the first people there. We had arrived in a winter place, a moment of the North. We walked in falling snow. 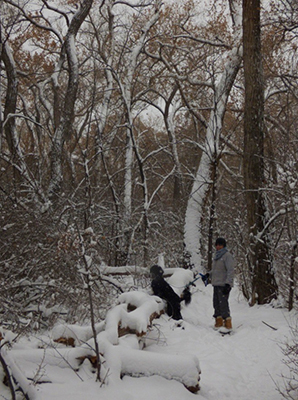 Snow lay inches deep on the ground, on the trunks of old fallen trees, on bare limbs and the tops of shrubs. A Cooper’s Hawk flew over. Only him. Only us. The third snow morning’s sky presented its uncertainty. Grey, with slits of blue. Winter, with the possibility of spring. The air was warmer. The snow, already partly melted in the yard from the feet of sandhill cranes coming to feed on corn, and the myriad crows who accompany them in pursuit of a free meal, receded further. 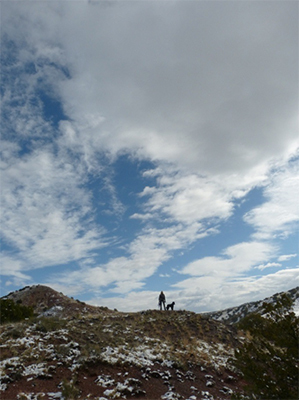 With the roads clear, we decided to go for our frequent Sunday hike in the foothills between Placitas and the mountain. 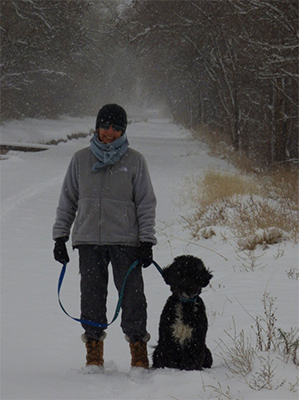 We call it our New Year’s Hike, a hike we can do even if (if) the mountain itself is snow-covered. Or, somewhat so. We’ve done it on New Year’s Day since moving here in 2001. We’re doing it more often now as we train Luke to hike with us rather than after the nearest coyote. By the time we reached the turnoff to the dirt road providing access to a number of trails, the sun was out. The road was mud. Glistening, slick, slippery, treacherous mud. The kind of mud that gives ice a good name. Instead of driving on to our intended trail, we stopped at one a few yards in from the highway. It, too, was muddy in places, but there was snow enough still covering it that it seemed worth a try. We hiked until, higher up, there was simply too much mud. Where the sun had been hitting longer, melting snow longer, the trail became similar to the road. We turned around. I’m not fond of turning around without having reached some sort of goal. I am less fond of mud. I do, in fact, loathe mud. It’s why I’m neither a mason nor a gardener. It is, perhaps, why I’m a writer. Writing, whatever the things one must push through, is not muddy.